I experience joy in many aspects of music: performing, composing, teaching, collaborating, and leading and sharing sacred music in community settings. Music can connect us across apparent differences and transform our relationships with ourselves and others. As Karl Paulnack once said in his Boston Conservatory welcome address, "Music has a way of finding the big, invisible moving pieces inside our hearts and souls and helping us figure out the position of things inside us." 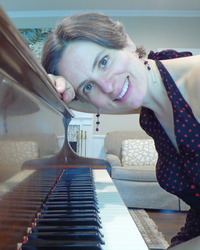 In addition to teaching music and theater in public and community music schools, I have taught piano to students of all ages for over 25 years. I tend to tailor the lesson plan toward overall student goals while simultaneously leaving room for exploration of new paths for learning. I teach from a repertoire of classical, popular, Broadway and jazz styles and supplement lessons with theory and improvisation. I enjoy the uniqueness of each student's learning process and how piano studies can help students grow both at the piano and as people. While connecting us to our deepest nature, the study of a musical instrument also teaches commitment, discipline, and the value of process. Growing up with parents who were both professional pianists nourished in me a deep love and sustaining relationship with music. In addition to performing concerts throughout my career, I have also worked in musical theater and have provided music for dance workshops, spiritual services, and special events (including as part of a kirtan band). I enjoy collaborating with others musically and have performed frequently in recent years with my father, which is a real honor! As a composer, I receive commissions for custom songs and music, and delight most in writing vocal music with accompaniment.